St Annes’ eagerly-awaited seafront Splash! park will be officially opened on April 3. The £259,000 joint project between Fylde Council and St Annes Promenade Gardens Friends is housed in a long-disused former paddling pool area on South Promenade and is designed to appeal to three- to 12-year-olds. It will be free to use and available, weather permitting, seven days a week through the main tourist season. 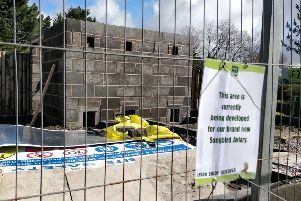 Ian Roberts, chairman of the Promenade Gardens Friends, said: “We are delighted to see this project come to fruition. 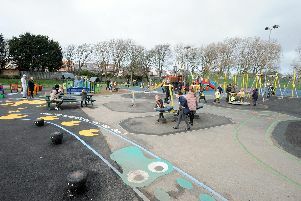 Fylde Council leader Coun Sue Fazackerley (pictured inset), added: “This is the realisation of a dream for me and excellent use of a well-loved feature of the Promenade Gardens. “This area has been long neglected and when I became Cabinet member for Tourism and Leisure I managed to persuade my Cabinet colleagues to back the scheme to the tune of £150,000. The Council has also released more than £70,000 from new development for community use towards the scheme.